Overnight it seemed shell suits went out and fleece were heavily in. Everything fleece was available, vests, jackets, pants, socks, toques. Worn by everyone from little kids to senior citizens to even your pets. No more coats and jackats, or thick wooly jumpers, life was going to change in the 90’s for all age groups, although the quality of many later fleeces was dubious, some getting heavily ingrained with last weeks meals, made them unattractive as old dressing gowns after one wash.
For all its negatives fleece fashion must be recognised as useful lightweight warm garments, but it’s worth paying a little more for a quality item in a subtle colour that retains its appearance after washing and wearing, rather than the cheap ones made out of recycled plastic bottles. Fleece fashion products are still currently worn by many and look here to stay for many decades to come. 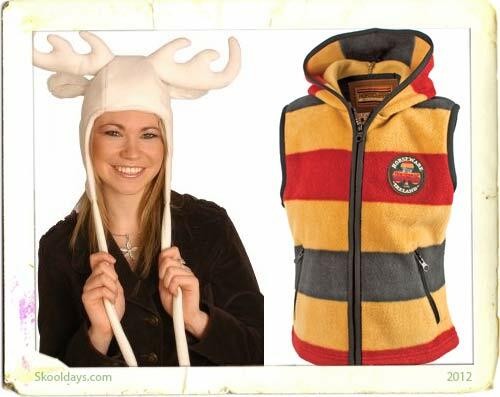 Fleece fashion is also on the rise, as the number and types of fleece garments available continue to grow. You can now find fleece clothing, outdoor gear, and fleece accessory items for men, women, young adults, children, and even for your pet! So the 1990’s has left something with us – a warm alternative to the grey granny knitted pullover of the 1970’s and the cardigan of the 1950’s fashion. This entry was posted in Fashion and tagged 1990 by Skooldays. Bookmark the permalink.